Minnesota native and Memphis coach David Joerger, who played college hoops at Concordia College and Moorhead State and paid his dues as a minor-league assistant, was hired as the Grizzlies' head coach on June 27. MINNEAPOLIS — It’s been 16 years since David Joerger first stepped out of Minnesota — long enough to rid his memory of the bitter chill of a Northern winter. "I forgot about this," the Grizzlies coach said with a mock shiver outside the Target Center’s away dressing room following Memphis’ morning shootaround Friday. The Staples, Minn. native and his team arrived in the Twin Cities in the middle of Wednesday night, just in time to see several inches of snow blanket the area and wreak traffic havoc. But this wasn’t a rude reminder in the rookie head man’s eyes. Snow, cold and all, this is home, he says. And he returns having blazed a trail even he didn’t consider all that plausible. "We were sitting there in the Skyway food court, (my wife) Karen and I, we were just like ‘this is different,’" gushed Joerger, promoted this past summer to replace Lionell Hollins. "I can’t really describe it. It’s home, these are, we are all in this together, we’re all Minnesotans. I didn’t articulate that very well, but it’s a real good feeling." After taking over for a man who led the Grizzlies franchise to unprecedented accomplishment, Joerger has guided them through a slew of injuries and now has a mostly healthy group eyeing another postseason run. That’s left him without much time to sit back and realize the kid who played college hoops at Concordia College and Moorhead State then paid his dues as a minor-league assistant is now overseeing the likes of Marc Gasol and Zach Randolph. But as the team plane touched down in the state he inhabited until becoming one of semi-pro hoops’ biggest success stories, he finally began to realize just how far he’s come. Genuine joy rang through NBA’s third-youngest head coach’s voice as he described the sensation. "Today is very emotional for me . . . for the first time to kind of like, ‘whoa,’ because this home," Joerger said. "To have it happen here, because there are so many games, practices, you’re just trying to survive so many injuries, that I haven’t looked up. "Finally yesterday, it did kind of hit me." After 13 years as an assistant for the International Basketball Association’s Dakota Wizards, Joerger became the team’s head coach in 2000. He presided over a championship that year and a move to the Continental Basketball Association — which merged teams from the IBA, International Basketball League and CBA — the following offseason. He’d go on to win four more titles as the Wizards’ head honcho, including the 2007 NBA Developmental League crown (he coached the CBA’s Sioux Fall SkyForce for two seasons before returning to the Wizards, which had since moved to the D-League). Five championships and two CBA coach of the year awards later, he joined the Grizzlies as an assistant and in 2011 became Hollins’ top aide, primarily responsible for directing one of the NBA’s most tenacious defenses. Memphis last season became the first team since 2005-06 to hold opponents under 90 points per game (89.3) and rode that defense to the league’s best post-All-Star-break record and the Western Conference Finals. But new front-office management decided to part ways with Hollins — the organization’s winningest coach — after San Antonio swept the Grizzlies out of the postseason. They stayed in-house to replace him, hiring Joerger on June 27. It was a day he’d thought could happen. But until it did, Joerger wasn’t convinced. "You don’t get to decide as a coach that you want to do it," Joerger said, "because somebody else has to come with a magic wand and touch you on the shoulder." The first half of his first go-around has seen its share of struggles. While Joerger’s worked to establish consistent rotations and establish a certain style of play, he’s had to deal with a handful of injuries. Gasol went down with an MCL sprain that kept him out of 23 games. Since his Jan. 14 return, the Grizzlies are 7-1 and half a game out of the Western Conference’s final playoff spot. Directly behind them by 1 1/2 games: the Timberwolves, whom Joerger and his Staples High School teammates used to watch from the Target Center cheap seats. He’ll have friends and family on hand from Staples, Bismarck, N.D. — former home of the Wizards, now the D-League’s Santa Cruz Warriors — Sioux Falls, S.D. and the surrounding areas. Joerger’s not sure how many will come; his brother handled ticket requests while he hatched a plan for limiting Kevin Love, Kevin Martin and Ricky Rubio. "You think you’re leaving 30 tickets and 45 will show up," Joerger grinned. But no matter who makes the game, the first-year coach can gaze into the rafters and remember when and where this wild ride began. "It’s very exciting. 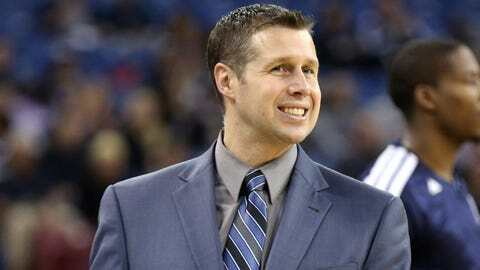 It’s very humbling," Joerger said. "Certainly a dream come true to be able to come coach here. I remember coming to games, and it was just the biggest deal in the world." Starting again: Ronny Turiaf has done just about everything in his eight-plus years in the NBA. So starting back-to-back games for the first time in two years, while different, isn’t overwhelming. "Do I have a choice? No, I don’t," Turiaf said. "So I’m adjusting to it. This is different, but it’s nothing that I haven’t done in the past. I’ve started plenty of games in the past — in the playoffs, in the conference finals, whatever the circumstances was — so this is something that I’m used to, stepping in when somebody else goes down. So it’s a matter of just going out there and being myself and hoping for the best." 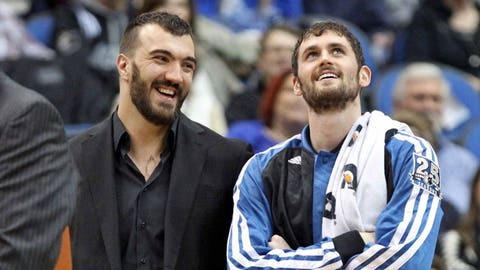 Until starting center Nikola Pekovic returns from bursitis in his right ankle, the 31-year-old Turiaf is Minnesota’s No. 1 man in the middle. He’ll make his 108th career start Friday night against Memphis after posting four points eight rebounds and an assist in Wednesday’s victory over New Orleans — his first regular-season start since April 10, 2012. He’s made 11 postseason starts, including seven for the Heat on the way to the 2012 NBA Finals championship. It requires a different mindset, Turiaf said. He’s now required to defend the opposition’s top center right away, and he’s no longer entering games midway through the first half with fresh legs. "It’s just tweaking it," Turiaf added. "Nothing major." Pekovic’s injury is expected to keep him out until at least the middle of next week. Championship connection: It didn’t take long for Turiaf to establish a special bond with current Grizzlies small forward Mike Miller. Then again, Turiaf’s a pretty friendly guy. The two role players spent the final month of the 2011-12 season and that campaign’s playoff run getting to know each other. It culminated in championship rings for both, the subject of frequent conversation and reminiscence whenever they cross paths. That included a brief, face-to-face get-together Thursday night in Minneapolis, an off day for both teams. "We were a band of brothers that, quote-unquote, went to battle to try to earn this right to become a champion," Turiaf said. "We don’t necessarily talk all the time, but it’s always fun to be able to see familiar faces that you went through the trenches with." 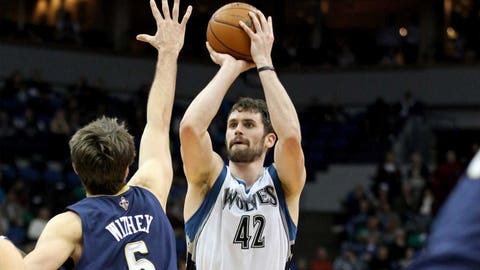 Miller, 33, signed with the Grizzlies as a free agent in the summer. Smile and perform: There’s a little more light in Ricky Rubio’s long lash-encased eyes lately. That’s what a successful six-game stretch will do for a young point guard struggling to find a rhythm. The third-year pro hasn’t found all of it yet — he leads the league in steals (2.6 per game) and ranks fifth in assists (8.2) but continues to be woeful (35.8 percent) shooting from the field. While that area of the Spaniard’s game has drawn a bevy of scorn from media and fans, his confidence appears to have taken a turn for the better. "When you’re winning, everything is different, you know?" Rubio said. "I feel much better out there and just being myself." Heading into Friday night’s contest, the Timberwolves have won five of their past six games — their best sextet of the season. Rubio’s distributed well, too, dishing out double-digit assists in three outings during that run. The point production is another story. But that’s not keeping Rubio down, so long as his team is winning. "Of course, you want to get better every day and do everything better," Rubio said. "But, I mean, when the team wins it means something good is happening. So we’ve been going through a good stretch, feeling good, and we’re going to try to keep doing that."